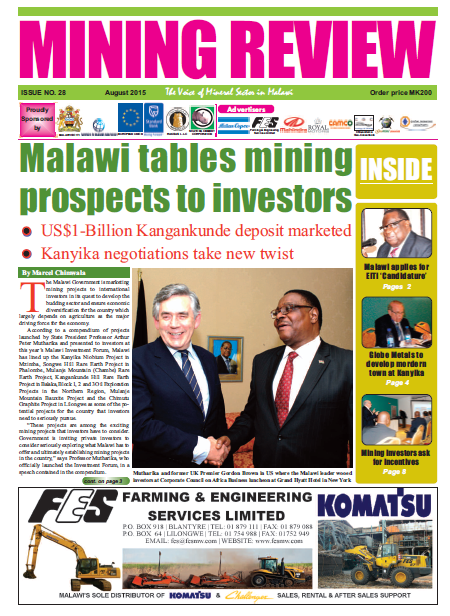 The piece “Malawi tables mining prospects to investors” featured below was initially published in Malawi’s Mining Review Issue Number 28 2015 that is circulating this August 2015. The Malawi Government is marketing mining projects to international investors in its quest to develop the budding sector and ensure economic diversification for the country which largely depends on agriculture as the major driving force for the economy. According to a compendium of projects launched by State President Professor Arthur Peter Mutharika and presented to investors at this year’s Malawi Investment Forum, Malawi has lined up the Kanyika Niobium Project in Mzimba, Songwe Hill Rare Earth Project in Phalombe, Mulanje Mountain (Chambe) Rare Earth Project, Kangankunde Hill Rare Earth Project in Balaka, Block 1, 2 and 3 Oil Exploration Projects in the Northern Region, Mulanje Mountain Bauxite Project and the Chimutu Graphite Project in Lilongwe as some of the potential projects for the country that investors need to seriously pursue. says Professor Mutharika, who officially launched the Investment Forum, in a speech contained in the compendium. In the speech that was made last year at the Corporate Council on Africa Business Luncheon at Grand Hyatt Hotel in New York, USA, President Mutharika says Malawi has a lot of unexploited minerals including coal, niobium, gemstone, heavy mineral sand, uranium, rare earth, silica sand and pink granite. In fact, the deposit of rare earth is supposed to be one of the largest in the world. We are exploring for oil in Lake Malawi and there is good evidence that we have deposits of oil and gas under Lake Malawi. oncessions have been given for exploration and we will be careful to protect the lake as you know Lake Malawi is the third largest lake in the world. It is a lake with over 4,000 species of fish thus more than any other lake in the world. We will try to protect it as we develop our mining industry. According to the compendium; in the oil exploration subsector, Malawi is seeking private investors to partner tenement holders in prospecting for hydrocarbons in Block 1, 2 and 3 oil exploration blocks located in the northern side of Lake Malawi. Block 1 tenement is held by South African company Sacoil Holdings while Blocks 2 and 3 are owned by UAE firm Hamra Oil Holdings. Malawi also granted oil exploration licences for Blocks 4 and 5 to giant UAE firm RAKGAS and Block 6 to another expatriate firm Pacific Oil Limited. Hamra Oil completed a Full Tensor Survey for Blocks 2 and 3 while RAKGAS also completed the same in Blocks 4 and 5. Pacific Oil is yet to conduct a full tensor survey because the time to launch the survey in Block 6 coincided with a recent suspension order for oil exploration by the Malawi Government, which the Ministry of Natural Resources, Energy and Mining issued to give a chance to the Government to review oil exploration licence terms. On the Kanyika Niobium Project, which is owned by ASX listed Globe Metals & Mining, the Government is still negotiating for a developing agreement with the firm which has acquired a mining lease for the area. Sources say the development agreement talks have taken a new twist as the Chinese majority shareholder in Globe Metals has indicated that it is not comfortable with the 5% prescribed royalty rate offered by the Malawi Government which is said to be higher than the average royalty rate in Africa pegged at 3%. The sources further reveal that the broker of the negotiations is considering that if an agreement to suite the Chinese investors is not reached, a controlling 90% shareholding in the project be sold to local investors who would be willing to strike a deal based on the 5% royalty rate prescribed in the country’s Taxation Act. Globe Metals & Mining dangled a deal to the Malawi Government, which was similar to the development agreement for Paladin Africa owned Kayelekera Mine in Karonga that gave the Malawi Government 15% shareholding in exchange for a reduced royalty rate of 3%. ASX listed Globe has completed ground work on the Kanyika Mine, which seeks to produce niobium, uranium, tantalum and zircon. On the Songwe Hill Rare Earth Project, the Ministry of Trade and Industry indicates in the compendium that the cost of operating the project stands at US$200-million. says the Ministry in the Compendium. The deposit with over a 20-year mining life is owned by UK Firm Mkango Resources through its wholly owned subsidiary Lancaster Exploration. Mkango, which is listed on the TSX Venture Exchange, completed a pre-feasibility study of the project and is working on launching a definitive feasibility study. The Kangankunde Rare Earth Project, which is owned by ASX listed Lynas Corporation is estimated to be worthy over a billion dollars and so far 11-million tonnes of ore with an average grade of 2.0 % REO and 8% for strontium have been proved at the site. However, development at the site has been affected by legal wrangling pitting the Government and tenement holders as a South African company that originally owned the exclusive prospecting licence for the site, Rift Valley Resources, sued the government for not renewing its licence. The Government had awarded the licence to another company Rare Earths which later sold it to Lynas Corporation of Australia which is failing to make substantial progress at the site because of the wrangle that has resulted in a number of injunctions restraining the project. The Mulanje Mountain Bauxite Project seeks to extract and process bauxite reserves in excess of 25.6-million tones discovered so far. The economic deposits of bauxite are found on the Lichenya and Linje Plateaus on Mulanje Mountain at an elevation of 2000 metres above sea level. The Project, owned by Springstone Limited, a subsidiary of Canada’s Grand Canyon Resources, is expected to produce an annual mining output of 500,000 tonnes of bauxite to produce 200,000 tonnes of alumina to be refined into 100,000 tonnes of aluminium. The Chimutu Graphite Project seeks to explore 2.7 million tones of graphite ore averaging 5.8% carbon delineated from a drilling and trenching programme during the course of a feasibility study. says the Ministry of Trade in the compendium. The graphite project is owned by ASX listed Sovereign Metals which is yet to establish the total cost of extracting the ore.
Large resources of flake graphite have also been discovered at Chimutu to the East of Lilongwe. With funding from the World Bank and the European Union courtesy of the Mining Governance and Growth Support Project (MGGSP), the Malawi Government has intensified promotional activities for the mining sector which have involved the launch of a new Mines and Minerals Policy. The new policy seeks to guide the government in its quest to ensure economic diversification from overreliance on agriculture and consequently see Malawi making a paradigm shift from an agro-based to mineral based economy. With the support of MGGSP, the Ministry of Natural Resources, Energy and Mining also conducted a high resolution country-wide Airborne Geophysical Survey Programme involving magnetic, radiometric and gravity survey. The survey was aimed at acquiring critical mineral occurrence data for updating the current geophysical and geological database and, according to Director of Geological Survey Department Mr. Jalf Salima, the data will be put online soon for prospective investors’ to easily access. Under the same project, the Government is developing the Artisanal and Small Scale Mining Policy and is reviewing archaic legislation including the Mines and Minerals Act of 1981 and Petroleum Exploration and Production Act of 1983.